浅析RTB中的竞价策略 | Youmi Tech Blog. Zhang, W., Yuan, S., & Wang, J. (2014, August). Optimal real-time bidding for display advertising. In Proceedings of the 20th ACM SIGKDD international conference on Knowledge discovery and data mining (pp. 1077-1086). ACM. Zhang, W., Yuan, S., Wang, J., & Shen, X. (2014). 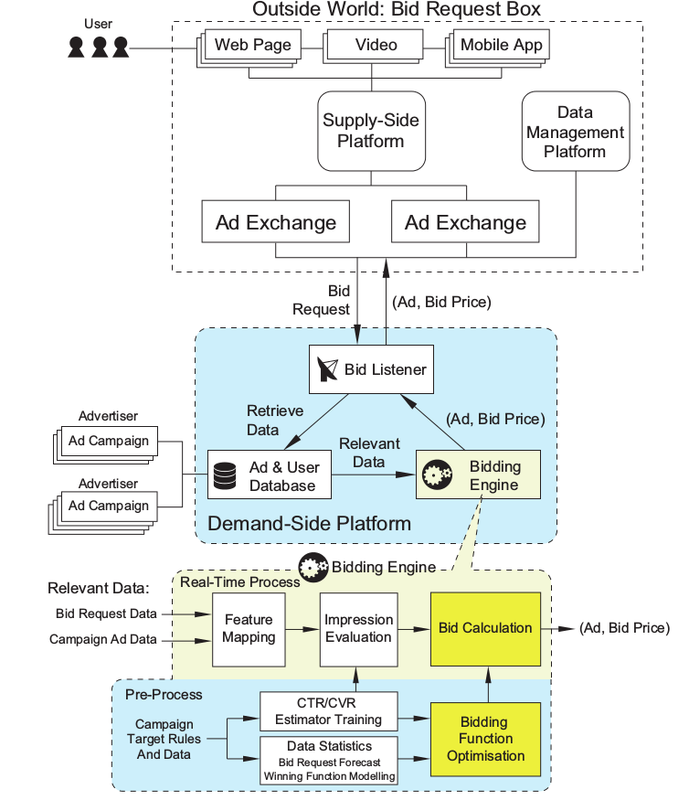 Real-time bidding benchmarking with iPinYou dataset. arXiv preprint arXiv:1407.7073. Zhang, W., & Wang, J. (2015, August). Statistical Arbitrage Mining for Display Advertising. In Proceedings of the 21th ACM SIGKDD International Conference on Knowledge Discovery and Data Mining (pp. 1465-1474). ACM. Perlich, C., Dalessandro, B., Hook, R., Stitelman, O., Raeder, T., & Provost, F. (2012, August). Bid optimizing and inventory scoring in targeted online advertising. In Proceedings of the 18th ACM SIGKDD international conference on Knowledge discovery and data mining (pp. 804-812). ACM.